Welcome to Found Off The Street, our look at cars usually found on the cape that rust liked so much it decided to summer there; Cape Cod, MA. Today we have a special Found off the Cape 1959 Cadillac. Last week's 1957 GMC Panel Truck spent quite a bit of time sitting exposed to the harsh Massachusetts winter climate and had the scars to prove it. 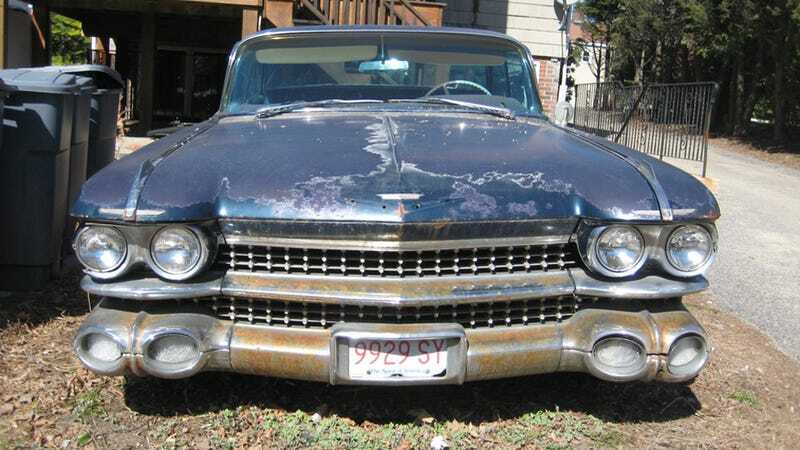 Although this week's 1959 Cadillac was found outside of Boston, about 70 miles north of the cape that rust remembered, it has been exposed to the same harsh New England winters. Like the panel truck, this old Cadillac's condition is a clear indicator the car has spent some time outside. FOTS happened to go off cape this week not because we've run out of cars on the cape rust remembered, but because this Cadillac was too good of an off street find not to share. A rusty set of fins is hard to pass up, especially this pair. I was lucky enough to grow up around a beautiful original 1959 Cadillac (more on this in a future FOTS), which has left me with a deep love of these flamboyant cars. Like every other Cadillac that left the factory in 1959 this one is equipped with a 390 cubic inch V8. I believe this Cadillac is a Series 62 rather than a Sedan de Ville from the lack of options on the car. The tell tale emblems for either model are missing from this particular example with no evidence of where they once were. Regardless of the exact model, the body style is a 4 window "flat-top" sedan, nicknamed for its unusual rear window design. One look at the back of a 1959 Cadillac is all it takes to understand why the one year only design is one of the most recognizable cars ever made. The '59 Cadillac is recognizable to millions of non car lovers around the world, and represents the pinnacle of late ‘50s and early ‘60s American car design. Other fins might have been higher, but few were as overstated and recognizable as those on the 1959 Cadillac. As you might imagine, a car with a design this iconic isn't usually something you come across for sale too often, and when you do the cars are usually total basket cases or high dollar cars in excellent condition. Finding a driver quality 1959 Cadillac at a reasonable price is a nearly impossible feat. For this reason, when I came across a one line advertisement for a "59 Caddy" on Craigslist last week, I decided to take a closer look. The car was advertised for $2500 and from what I've seen in the past that rarely buys you much vintage Cadillac. I was pleasantly surprised when I showed up to find the car you see here. Like most old project cars in Massachusetts, there was some rust, but not so much it was beyond repair. The car was complete and miraculously the hard to find and very expensive curved glass was perfect. Even though the engine was stuck and mice had spent some time in the car, I could see the potential. Last driven four or five years ago, this old Cadillac had been sitting next to a set of trash cans behind an apartment building ever since while the harsh elements took their toll on the car. I'll admit it, I was sold from the second I saw this car, especially since the recent sale of the Bumble Bee Valiant had left me without something old and rusty that didn't run. Despite my immediate desire to own the old beast, I decided to take the night to sleep on it. You can probably guess what happened at this point. I made the call set on purchasing the car only to find some other less hesitant vintage Cadillac buyer had already purchased the car. All week I've been trying to convince myself that it is for the best that I didn't end up dragging the massive Caddy back to the cape rust remembered. Memories of bringing my '57 Plymouth back to life and a hopeful vision of a loving new owner have convinced me it's probably for the best. For now, this self consolation will have to fill the large void that would otherwise be taken up by 4770 pounds of old rusty Cadillac project car hell.